​These stories derive from the journal of a former detective Andries Johannes Hoffmann (born c1871 –died c1953). ​​It is necessary to contextualize this remarkable historical account of a life of a Policeman in the Union of South Africa for the reader of today. It is necessary so that words like ‘native’, ‘coloured’. 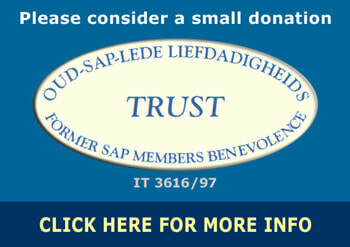 ‘kaffer’, maid’, ‘kraal’ and ‘shambok’; used liberally within the text are read in the context of the popular expression freely used in the society and the era they were a part of. 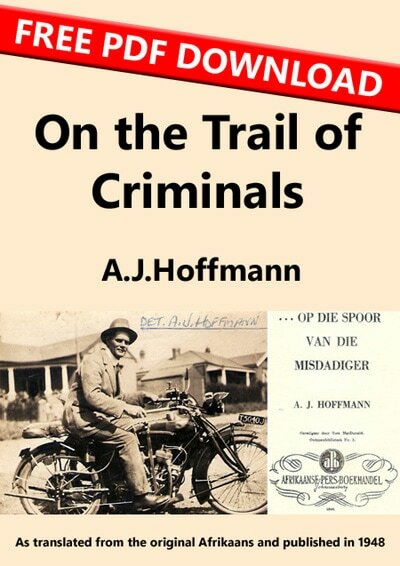 Detective Hoffmann KPM  has provided us a wealth of colourful and informative information about life in the Union of South Africa and about Johannesburg in particular at its formative and often turbulent journey when the term ‘Wild-West’ may have been an apt description. Imagine being left in charge of the family farmstead at the tender age of 17 and then the worst possible hailstorm arrives and wipes out all livestock, crops and equipment leaving the family homeless. Imagine arriving on the Rand as a young man of around 22 when Johannesburg was little more than a smoky mining camp of shanty buildings, dusty markets and dirt roads occupied by a concoction of bandits, thugs, bootleggers and prostitutes. Watching it develop into a fully-fledged international city but not before enduring a civil war, bloody industrial action and severe economic depression. 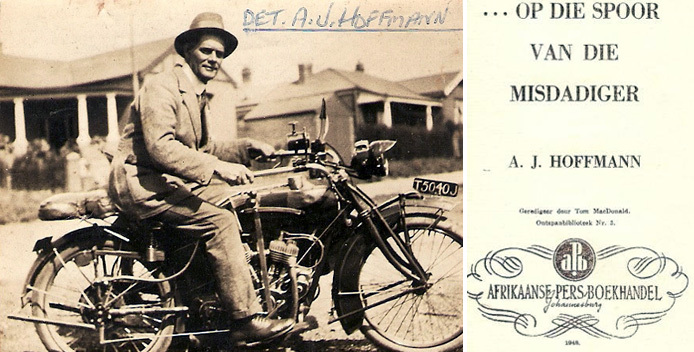 An aspiring farmer and craftsman of transport wagons, Hoffmann was thrust in desperation into the often lonely life of law and order enforcement. His command of native languages, deep appreciation of local cultures along with a good level of physical fitness, a sound work-ethic along with the patience of a saint served him well. The lure of gold and fast riches attracts the most interesting and also the vilest of humanity. Mix in the racial and cultural melting-pot that is Johannesburg and add a generous sprinkling of superstition and quackery and you have a recipe for beautiful chaos. Despite all this Hoffmann sets an amazing example of professionalism, restraint and honour in the face of enormous danger. His empathy and respect for his victims and for the plight of the poor is evident throughout his story. We can learn from this and we can hope not to make the same mistakes again.